An investment in your child’s future. We understand that sending your child to Darlington School is a significant investment, but rest assured it is one that will pay big dividends for your child’s future. Our students graduate with the confidence, connections, and compassion they need to succeed in college and their career, and be meaningful contributors to the greater good. Many of our families take advantage of our tuition assistance opportunities that help make Darlington more affordable. These include need-based financial aid, merit scholarships, the Georgia GOAL Scholarship Program and our Alumni Legacy Award. Darlington partners with FACTS, an independent provider, which offers a platform for parents to make online payments safety and securely. Several payment plans are available to accommodate your budget. 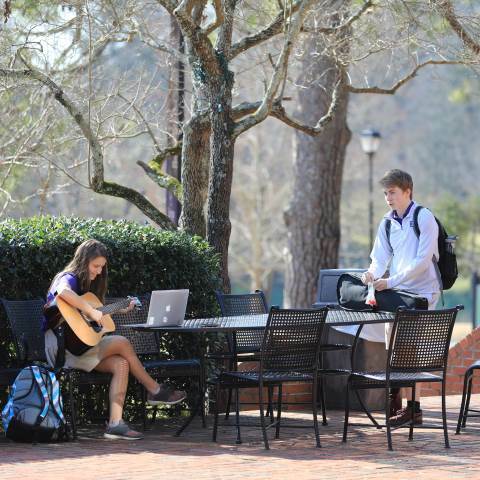 To learn more about how we can help make Darlington School more affordable for your family, please contact Carolyn Brearley ('99), director of GOAL and financial aid. As Gatlin Hancock ('22) was getting ready to enter middle school, his parents Ronda and Scotty knew that he was up for an academic challenge and an opportunity to grow. Taking the advice of friends, they applied to Darlington and learned that this option was an affordable one for their family and they knew that it would be the right place for Gatlin. This fee provides each family membership to every parent organization and all benefits of membership. This fee allows Darlington to provide books and other required instructional resources. Families will not be required to purchase books unless additional copies are needed beyond those provided electronically or in class. Uniforms are required for all students; however, the expense varies depending upon uniform items purchased. This fee helps to offset the cost of instructional technology tools and infrastructure, including software and a school-provided iPad for grades 4 to 5. This fee helps to offset the cost of instructional technology tools and infrastructure, including software and a school-provided MacBook for grades 6 to 12. All students taking an Advanced Placement (AP) course are required to take the AP Exam. This fee provides health insurance coverage in the United States during the school year. International students may pre-fund an allowance to be distributed weekly by the Business Office. Focusing on grades 2-5, this program provides necessary remediation with experienced learning specialists, while enabling students with dyslexia who are enrolled in the program to benefit from the full Darlington School experience. Fee includes training, US Club registration, Nike Soccer Academy gear, recruiting assistance, college guidance, tournament/showcase entry fees, college scrimmage opportunities, team tactical video analysis and video footage of games. Travel is not included.